Thousands of people have taken part in memorial events around the world to celebrate the life of MP Jo Cox. The Labour MP and mother of two was shot and stabbed in Birstall, West Yorkshire, on Thursday. Organisers said the events, on what would have been her 42nd birthday, were to "show the world we have more in common than that which divides us". Her family took to the Thames in a memorial boat before an "an event for a wonderful woman" in Trafalgar Square. The boat, covered in roses and bearing the name "Yorkshire Rose", was pulled along by a barge carrying her husband Brendan Cox and children Lejla, three, and Cuillin, five. Image caption Some broke down in tears as he told them Jo's killing "was an act of terror designed to advance an agenda of hatred towards others"
Her family started the journey from the London houseboat where they had lived with Jo. Tributes also took place in New York, Paris, London and her Batley and Spen constituency. In Batley, one moment of cheer came when the crowd was told Bernard Kenny, 78, who had been stabbed in the stomach as he went to the aid of Mrs Cox, was also celebrating his birthday. Mr Kenny, who has now been discharged from hospital, called her death "a very sad loss for the community". Among those paying tribute were US President Barack Obama, who said the MP believed in "the power of people to bring about change". In a Facebook message Mr Obama hailed the mother-of-two, who volunteered for his 2008 presidential campaign, for her work with those close to home and around the world. Describing events in Batley and a moments silence in Jo's honour, the BBC's Trevor Gibbons said: "The silence when it came was total and heartfelt, save for the cries of a baby and the bark of a faraway dog." He said the event became a celebration of a remarkable life, with speakers calling it a "show of unity against evil". Hundreds also attended events in Washington DC, Dublin, Brussels, Oslo, Buenos Aires, Auckland and Beirut. At Portobello Beach in Edinburgh, friends of Ms Cox gathered to celebrate her life. Her photo was placed on the sand next to 300 candles arranged into the words "More In Common". Kim Wallace, a friend and former colleague of Ms Cox and her husband, said: "Jo was fearless in standing up for her beliefs and was a force for good, bringing people together. "Jo was irreplaceable in many ways, but most especially to her children. "As a mother, my heart breaks that they now have to grow up without her." A candlelit vigil was held at a women's charity centre in Syria "in honour of her support for Syrian women", the Women Now For Development organisation said. Media captionBrendan Cox: "She had very strong political views and I believe she was killed because of those views"
During an emotional speech in London, Mr Cox said: "Thank you to Jo's amazing friends, and friends of friends, and even complete strangers who have managed, despite your own grief, to organise all of this in less than a week. "As amazing and deeply touching as all of this is, I wish I wasn't here today. Not because I'm ungrateful to the organisers and you all for coming, but because of course I'd rather be with Jo. "But I wanted to come and show my gratitude and that of all of our family. "Your support and love has helped us all and I wanted our children to see what their mum meant to all of you. I know that they will remember today." One of the first of the day's events took place in Australia, where people gathered in Macquarie Place in Sydney. Organiser Nic Seton, who was a neighbour of the MP when he lived on a houseboat in London in 2010, said the gathering was "to celebrate Jo's life". "When I saw that these events were happening in other places I turned to a few friends and I've been overwhelmed by the support that I've received and the number of people who have said they would be here tonight," he said. 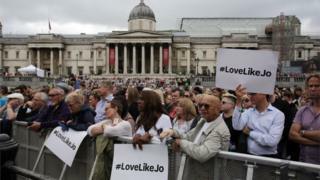 Tim Dixon, a friend of Mrs Cox attending the London event, said: "Jo symbolised something about this moment, where we are, that people want to come together and rise up in love over hate and hope over fear. "I think there's something that she's touched very deeply in people's hearts that goes well beyond Britain." Speakers at the Trafalgar Square event included Malala Yousafzai, who highlighted some of the causes Jo supported. Former cast members from the hit musical Les Miserables also sang at the event..
A charity album of live music by bands including Coldplay and Muse will be recorded at the Glastonbury Festival this weekend and will be released in her honour. Google added a link to Jo Cox's memorial fund on their UK homepage to help "honour and remember" the MP. The international enormity of the death of Jo Cox was made clear within hours of her death. Radio stations from as far as Australia, Canada and the United States rang me to record interviews about what had happened - they were all incredulous that a British politician had been killed in the street. That this happened in a small community in West Yorkshire is what astonishes - as far as they are concerned, it simply doesn't happen here. The outpouring of grief expressed in the growing mountain of flowers in Birstall market place, just around the corner from where she was killed, has made TV headlines in many more countries. The fact that she was also a mum just days away from her 42nd birthday makes it all the more remarkable. The tide of grief has reached all corners of the world. After her death, her friends set up a fundraising page, with proceeds to be divided between causes she had supported. Her husband Brendan praised the public's "incredible generosity" after donations to the fund topped £1m. Mrs Cox was attacked outside a library on her way to a constituency surgery. Thomas Mair, 52, from Birstall, has been charged with murder, grievous bodily harm, possession of a firearm with intent to commit an indictable offence and possession of an offensive weapon.